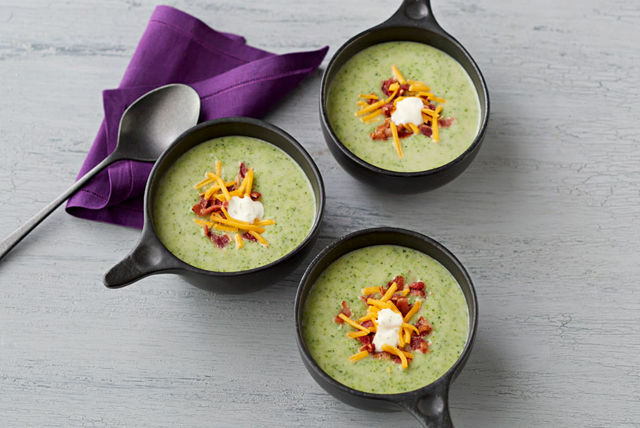 Cream of broccoli soup? Yes, please! Potato soup? Sure! Bacon soup? Whoa! Put them all together and you've got a new favourite soup for your recipe box. Cook bacon in large saucepan on medium heat until crisp. Remove bacon from pan, reserving 2 Tbsp. drippings in pan. Drain bacon on paper towels. Add onions to reserved drippings; cook and stir 8 min. or until tender. Add broth, water and potatoes; stir. Bring to boil; cover. Simmer on medium-low heat 15 min. or just until potatoes are tender. Stir in broccoli; cook 5 min. or until tender. Stir in 1/4 cup each cheese and dressing. Blend soup, in batches, in blender until smooth. Ladle into 4 bowls. Crumble bacon; sprinkle over soup. Top with remaining cheese and dressing. This delicious soup can be prepared ahead of time. Cool, then refrigerate up to 24 hours. To reheat, bring soup just to simmer in saucepan on medium-low heat, stirring frequently. Serve this hearty soup with a crisp mixed green side salad tossed with your favourite Kraft Dressing.